These templates are editable in docx - format, thus you may adapt them to your personal requirements. All Prices excluding VAT (means VAT will be added during purchasing process as applicable according to local legislation), with the transaction you explicitly agree to the ► Business Terms of the TQM Shop. Charging is executed by secure transaction via PayPal. Immediately after the transaction you will be provided a printable, tax deductible invoice via PayPal and transferred to the download page automatically. All our TQM templates come with a 60 day money back guarantee. 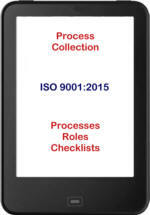 These tools and process sets are based upon our well known ► ISO 9001:2015 Process Library. It describes the processes of Quality Management utilizing the market leading process management system ► Signavio Process Manager notated in BPMN 2.0, and derives from the experience of nearly 20 years of successful TQM project implementation. accelerating your project remarkably and hence saving costs (especially external consulting costs). The purpose of these tools and process sets are not provision of theoretical knowledge, but demonstrate the experience of numerous implementations of process oriented quality management from practice. Practical relevance is the focus.